When I took over from A.C.Gimson as director of the UCL Summer Course in English Phonetics, one of the new ideas I had was to design and sell a course t-shirt. The t-shirts proved very popular among the course members, and over the years we produced a number of different designs, all with the transcribed text ˈɪŋɡlɪʃ fəˈnetɪks. One of my pictures shows a dark blue one modelled by Josette Lesser. Masaki Taniguchi has a large collection of them, often bearing the signatures of the tutors. A company called Cafepress now offers not only t-shirts but also mugs, stickers, and other gifts with a phonetic theme. 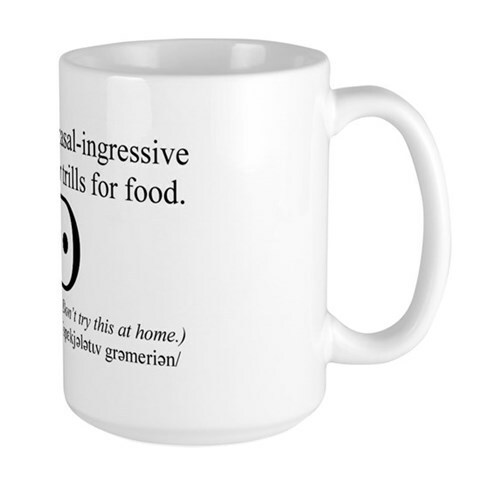 Offering someone coffee in a mug bearing the words “nasal-ingressive voiceless velar trills” would certainly furnish a talking-point (and perhaps lead your guest to snort and choke over their coffee). In response to several requests, notably among yesterday’s comments, I have now uploaded copies of the .ttf files of the Lucida Grande font to my website. You can find the font here, and the bold version here. To download the fonts, save to your own computer, then install. I don’t think there’s a problem of copyright in this file-sharing, since the font’s author, Charles Bigelow, says he is delighted if as many people as possible use his fonts. (1) Blogger specifies two fonts in its stylesheet: (a) Lucida Grande and (b) Verdana. The latter is far more popular. (2) As a result, if your machine does not have Lucida installed, the browser will default to Verdana. (3) Older versions of Verdana (e.g. on Windows XP) have a bug causing havoc with some diacritics. Described in comments to the Haiti post. (4) As the Opera browser has an internal fix for this, the problem will only be visible to users of Firefox and IE on Windows XP. (5) Solutions: (a) Download and install Lucida Grande, as made available by Prof. Wells above, and (b) as this will not correct the behaviour of Verdana (in Firefox and Word and elsewhere -- it's a system-wide problem), also download Microsoft's font update, as described here. (6) You can easily check if you're affected by looking at this page. In both renderings, the tilde should be over the epsilon. If it isn't, you need to apply the fix in (5) above. Oops! that should be Dziękuję, Jarku. Someone was explaining to me only the other day that Ukrainian and Polish, unlike Russian, still use the vocative case. I must have known that once, but I had forgotten it. But Gunnel has certainly pointed out a whole bunch of worse howlers than a forgotten Polish vocative, John! Dziękuję, Jarek. -- Nie ma za co! BTW, the vocative is really on its last legs in Polish. It will be used in formal writing, but spoken Polish will usually stick to the nominative. The vocative will only be used in some registers and situations for some names, as a more polite -- or, if you will, genteel -- way of addressing people. So, for example, Polsko 'O, Poland!' will always use the vocative (as you only say such things in poetry and the like); if you want to be extra nice in a request (or when thanking somebody...), Jarku will be just fine but e.g. Robercie 'Robert!' sounds incredibly stilted. And if e.g. calling someone across the hall, the vocative is really out of the question. Round these parts, people will usually give Czech as an example of a Slavic language that still uses the vocative a lot. Any Czech readers to (dis)confirm? Confirm. As opposed to Polish, the vocative's used normally without being stylistically marked. My first draft of this post was swallowed up through trying to use the IPA Unicode 5.1 keyboard. A dangerous tool! I attempted to type a tilda and got a screen refresh instead. Jarek's solution doesn't work for my Mac (running Snow Leopard). The system rejects the file for Lucinda Grande, on the grounds that a version is already installed, and required by the system. Actually it strongly advises against installing the new version. Could I safely disregard it? When I copy the page -- complete with 'deliberate mistake' it appears as intended on my Preview screen. I did this the easy way with Character Viewer and the dangerous way with the IPA Unicode 5.1 keyboard. I trust these appear as intended on other people's screens. Oops. I've now had a better look at the stylesheet, and indeed it specifies only Verdana for "bodyfont". Lucida Grande is used only for the title, sidebar etc. This means that installing Lucida will not help anyway. The two fonts are quite similar but now that I look at the body text of the blog, it seems it is rendered using Verdana. If your version is the old one, you're out of luck. (1) Download the Microsoft update. (2) This is an .exe file, so it will be useless on a Mac as such. But you can try to find a zip program that will open it as if it's a compressed archive. 7-zip and WinRAR can do this on Windows but from a quick look I can see they're not available for Mac. (3) If you're successful, you will be able to extract the font files. Then just install them as normal. I'll be seeing my brother-in-law later today. If he has his Mac laptop with him, I might do some testing. Our Linguistics Club at the University of Montana made shirts every year. My first year there they said "If you can read this, join the club" in IPA, and the second year we had a tree diagram of the NP "happy trees", with the words in IPA. I still think there's some joke to be made out of pirate NPs: ruthless c-commanders. As Geoffrey Pullum points out, all of Chomsky's technical metaphors reek of authoritarianism (rules, binding, government, command, constraints, barriers), which is very peculiar given his politics. Most importantly, you cannot disregard the advice against installing the new version of LG. If it will even allow you to override its rejection of it, that is, and for the reason that it gives: it is required by the system. Apparently it is actually a system font on the Mac. To install the downloads in John's blog entry my PC merely requires me to delete the version of LG I had already got hold of and installed. The Fonts folder would have you believe that you can't park things elsewhere, but I did that, and it seems that John's downloads are still of the version of LG I had already got hold of, and if it's any consolation to you they still don't have the things most of us still seem unable to see: barred small capital I [1D7B], barred Latin upsilon [1D7F] and [ᵾ], whatever that is. So I had come to the same conclusion as wjarek: no version of LG will help, and we have all been barking up the wrong tree since John suggested installing it on 11 and 15 December. In the meantime I had had a look at the stylesheet too, and seen it specifies only Verdana for "bodyfont", and we now have to embark on a new quest for an update of that. We have not really gone about this very efficiently, have we? I have not even had a chance to follow up the fixes wjarek and Kraut have been discussing on here recently. You must have a version with the new Unicode symbols I have mentioned, and so must army1987. Any chance of one or the other of you pointing us in the right direction? I use Firefox on Ubuntu, and got Verdana from the ubuntu-restricted-extra package. As for wjarek's test, the one labelled "Tahoma" has the tilde in the right place, but it uses a serif font for the consonants and a sans font for the epsilon. In the one labelled "Verdana" it seems to uses one font (or at least two very similar ones), but the tilde is on the s.
1D7B, 1D7E and 1D7F are in my versions of Times New Roman, Courier New, Arial etc, as included (I assume) with Windows Vista; also in Charis SIL and Doulos SIL from the sil.org site. As visible on my screen: ᵻ ᵾ ᵿ. The only fonts that display all of 1D7B-F (ᵻ, ᵼ, ᵽ, ᵾ ᵿ,) on my Mac are: Arial, Courier New, Geneva, Microsoft Sans Serif, Monaco, Tahoma and Times New Roman (some Regular only, some also Bold and/or Italic). 1D7B (ᵻ) is also in four styles of a font called Menio. 1D7F (ᵿ) is also in collection called Alphabetum Unicode, which is a good source of obscure characters. A nice-looking Church Slavonic, for example. None of the characters are present in Lucinda Grande or Verdana. @David: These are pretty esoteric characters, so you shouldn't worry. And they are not really susceptible to the problem we've been discussing. They are "whole" characters, which means that your browser will try to find a font that has them and will replace them. The result may not look pretty but at least it won't be incorrect. What we've been discussing is the (for some people) incorrect diacritic placement on this very blog. As I've said, this is due to the behaviour of an older version of Verdana (and it doesn't have anything to do with what glyphs are present in Verdana). Updating to the latest version of Verdana (5.01), as described above, corrects the problem. For the record, on my XP machine, 1D7B-F are only present in Charis SIL, Doulos SIL and Times New Roman (the Vista version). I don't think downloading will help. I've just discovered that my installed version of Lucida Grande is more recent that John's download. In your earlier post you directed us to an article on Verdana. It expressly states that the problem you had in mind does not occur with Mac OS X and Safari 4 -- which is just what I'm running. When I paste text copied from here into Word it appears in Verdana. At least, that's what happens if I'm working with Safari. When I copy from the same source via Firefox it appears in my default font for Word. I've noticed that difference in font between 'normal' characters and 'exotic' characters is much more obvious in Firefox than in Safari. However, there's no difference in the way they mis-position the tilda in John's postings and in Kraut's. I couldn't see your most recent posting when I was writing just now. I do understand that the absence of these characters from most fonts is not a problem. I was just offering a complete list as John's use of 'etc' (20 January posting) seemed to imply that the fonts with these characters were more numerous. I have been following the tilda/Verdana/Lucida Grande discussion. And I do have version 5.01 of Verdana. (Also version 6 of Lucida Grande.) I think my experience shows that the tilda-placing problem lies -- at least in part -- elsewhere. The Verdana problem apparently never affected computer set-ups like mine. On Wikipedia, barred small-caps-I and Latin-upsilon are often implemented with standard IPA symbols with "strikethrough" markup so that even people with small fonts can see them, but this blog doesn't let us use <s>. @David: I'm afraid we're stuck then. I can't test this -- no Macs around. Maybe it's a FF/Mac interaction... You said in one of your earlier posts the tilde was over the 's' in Verdana. Was that in FF or Safari? In both Safari and Firefox, John's transcription of the Creole appears as pɔtopxɛs̃. [On my screen, that's with a tilda over the s.] In Firefox, the phonetic symbol characters are smaller and lighter than the others. In Kraut's posting (the first full comment on the Haiti thread) it appears as pɔtopx̃ɛs. [On my screen, that's with a tilda over the x.] That could be a joke, of course. As far as i know, when I type with a tilda over the vowel it appears correctly: pɔtopxɛ̃s. It also appears as intended on Amy's post, shortly after Kraut's. Someone was explaining to me only the other day that Ukrainian and Polish, unlike Russian, still use the vocative case. In my limited experience, it's mercilessly always used in writing (that is... subtitles, even of South Park), and about half the time in speaking. I am probably overlooking regional differences in the latter, but I have for example heard the same person say o Matko and o Matka twice each, alternatingly on successive days, when told about catastrophes. I've heard a toddler called Dawidku by his mother, and double/triple diminutives formed from nicknames (like Madziunia, ultimately from Magdalena) also occur in the vocative in real life (Magda doesn't, IIRC). For what that's worth, I confirm about Czech, and add BCSM. I have also encountered one Ukrainian vocative in the wild. This might be the place to postulate that southern German has regained the distinction between nominative and vocative for personal names: the nominative (and the remaining two cases, dative and accusative) obligatorily comes with an article, while the vocative lacks it. On my screen, that's with a tilda over the s.
On my screen, that's with a tilda over the x. For me precisely centered over the ɛ as if that were a precomposed character! Looks perfect! This creates a space between the ɛ and the s and puts the tilde above it, in both regular and bold. David: mercilessly always used in writing (that is... subtitles, even of South Park). Well, in "published" writing -- absolutely. In private writing (e.g. email) -- not necessarily. postulate that southern German has regained the distinction between nominative and vocative. Interesting. In informal Polish, the vocative has replaced the nominative for some masculine names. I would doubt if it's perceived as vocative by the users, and it's definitely used as the nominative form. So, for example, the "augmentative nominative" of Lech or Stach would be Lechu, Stachu, as in Lechu powiedział... 'Lech(u) said', Stachu zrobił... 'Stach(u) did...'. Similarly, Rysiu, Czesiu, etc. I could bet that younger speakers don't even realise that these originate as the vocative of Rysio, Czesio (these two are not augmentative but straight diminutive, ultimately from Ryszard, Czesław). Thank you for commenting on how things appear to you. So it is an Mac/Windows clash after all. I just knew that David had lit on the no definite article the moment he mentioned Southern German! I did not know, nor foresee, nor could I have imagined, that In informal Polish, the vocative has replaced the nominative for some masculine names. This is what happens when Greeks talk about one another in other languages! We will have lost John W by now, otherwise I would have liked him to comment on that. Well, actually there may be a (morpho)phonological component. The set of names is quite limited and there seems to be a rule. But I haven't had the time to figure it out.
' The vocative will only be used in some registers and situations for some names, as a more polite -- or, if you will, genteel -- way of addressing people. Well, it is the vocative's job to be used in certain contexts and registers only, is it not? I happen to be a professor of a Polish university and I hear 'panie profesorze', which is 'pan professor' --- 'master professor', say -- every day so many times. It _is_ by all means formal, but even in Polish, hard to believe, we have formal registers. In informal registers, vocative forms are quite common with hypocorist forms of names, say 'Jasiu', 'Józiu', 'Zosiu', 'Krysiu', all of them vocative case hypocoristic forms of 'John', 'Joseph', 'Sophia', 'Christina', difficult to render in English. Non-hypocoristic forms of names in the vocative 'Józefie', 'Robercie' etc. do sound stilted, but that's what they are made for, innit? You do sometimes desire to sound stilted, do you not? Next to never, save in literary context, will anyone say 'kluczu' (voc. of 'klucz', 'key') or 'domie' ('house', voc.) -- but this lies in the nature of things. In a litany they address the Virgin Mary with 'domie złoty', Domus Aurea, such contexts are, naturally, very rare. While the vocative in today's Standard Polish has certain aspects of register, this is not at all a vocative's "job" in general, let alone in the nature of things. In many languages, including rather recent Polish and still dialects of Polish, it's the automatic case without any connations; in fact, using the nominative case would be a plain error. I can't think of a case when using the nominative instead of the vocative in Polish would be an error. In some rare cases it would be rather unusual, but an error, no, I don't think so. 'The nature of things' --- I meant by that e.g. that we seldom if ever address keys or houses the way we address persons; we talk about them, but not to them. Hence little use for the vocative. Of course, if you call a polymath 'encyclopedia', you can address him in the vocative: 'moja encyclopedio!' But such occurs seldom --- by the nature of things. My meaning any clearer now? I just wanted to clarify that there's nothing inherently high-register or formal if a language has a vocative case, even if in contemporary Polish, it is a matter of register, and that in most (other) languages with a vocative, you're not free to use the nominative instead. No, there is not. My point (originally) was that _even though_ the vocative in Polish is mostly stylistically marked, more or less, it is _not_ moribund, contrarily to what 'wjarek' had claimed. Maybe I overstated my case. However, when I think of the people I've talked to today -- Anka, Magda, Asia, Tomasz, Dawid, Natalia, Ewa, Maciej, Bożena, Maria, Grzegorz -- only Asia readily qualifies for an unmarked vocative. Possibly Ewa; maybe Maciej (but not really). The vocatives for all the others are really stilted and would give you suspicious stares in return (in face-to-face interaction, that is). That's -- let's be generous -- a 30% success rate for the vocative, at the very best. So, for first names, I would still claim the vocative isn't doing very well. Lipman -- how about taking 10 Czech names and seeing how many would use the vocative in everyday conversation? That was my point. Surnames? Forget it. I can imagine O, Mickiewiczu! when writing about the poet, but I would think it doesn't even count as Standard Polish to address a person with panie Mickiewiczu. Lipman, vocative for Czech surnames? BTW, as I mentioned earlier, masculine forms like Jasiu now work as the nominative, as in Jasiu to zrobił, so while diachronically they're vocative, it's hard to tell today. Whichever way you decide, it shows there's confusion among the speakers. I know see, thanks Lipman for starting me on this thinking track, that I have to sort of back-pedal on what I have claimed earlier and admit that there _are_ cases, rare though they be, where in Polish the vocative must not, and is not, be replaced with the nominative. I mean the cases where the noun in question refers to a non-personal being 'addressed' (for rhetorical or literary purposes) as if it were a person. For instance, in 'Master Thaddeus', the Polish national epos, we read, right at the beginning: 'Litwo, ojczyzno moja' (O Lithuania, my motherland, in the voc.) --- hard to understand if you do not Polish history. Again, somewhere in the middle of the book Mickiewicz (the author) 'addresses' the year 1812 with the words: 'o roku ów!' ('o yon year!' again in the vocative case). In neither case would the nominative have worked. For in the nominative the locutions would not have sounded as they should, i. e. as ones in which the poet is addressing the thing, Lithuania or 'yon year', but they would have sounded as if he was talking _about_ them. This again lies in the nature of things: if you say 'o that year' our understanding is by default that you are talking about a year, not to it; hence, the vocative case is indispensable. 'Macieju' (voc. of 'Maciej', Matthew) is stilted, but 'Maćku' (the same, hypocoristic) is not. Methinks at least. 'Panie Mickiewiczu' is not stilted; it is simply incorrect. Here the vocative case is impossible, a strange local rule. The vocative case is used in forms of direct address, and these are rather rare anyway. In English they say 'Sir! ', 'Madam! ', formerly too 'Master! ', maybe, too 'Guvner!' ('Governor'! ), -- had we had similar locutions in Polish, they would certainly have been in the vocative (as in 'Panie dobrodzieju! '), but we have this strange idiom 'Proszę Pana! ', 'Proszę Pani! ', 'Proszę słonia! ', which seldom fails to baffle a foreigner, where the honorific word is put in the genitive. Then, there are rules like that one which blocks the vocative in the 'panie Mickiewicz!' forms of address. Other than that, though, I'd say the voc. is well, not at all moribund; if some of its uses are 'stilted', it enriches our language by making it possible to in it sound stilted.